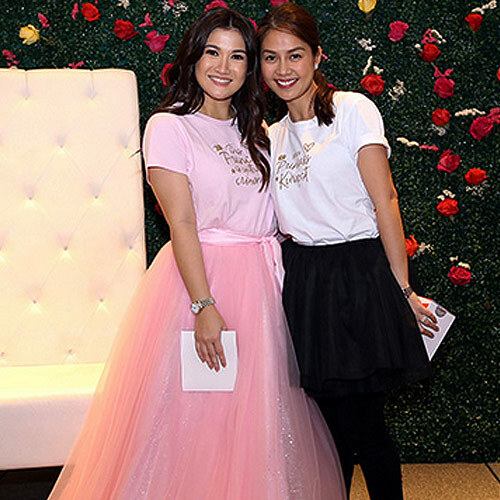 (L-R) Julia Barretto and Gabbi Garcia have been friends since high school; Camille Prats and Kaye Abad became close during their Ang TV and Tabing Ilog days. Given the exclusivity clause in most stars' contracts with their respective networks, we rarely see a Kapamilya being paired with a Kapuso in a project. Hence, the sight of ABS-CBN and GMA stars together in an event or even their simple exchange on social media usually hits the headlines. But friendship knows no boundaries even in showbiz. 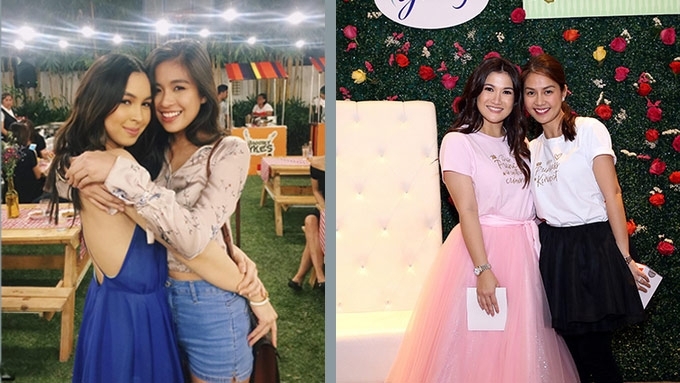 Here's a list of celebrity barkada and squads that are not affected by the network war. These two were barkada in an all-girls school. To this day, they are still in touch, and they attend each other's parties. Good friends and gym buddies, these guys are each other's plus one. Paul gets to attend some Kapuso events. See how the former child star felt at ease in the company of GMA's former tween stars. Likewise, Kristoffer gets to mingle with Kapamilya teens such as Barbie Imperial (4th from left), Chie Filomeno (middle), and Sue Ramirez (third from right), a close friend of Paul. Though the singer transferred to ABS-CBN in March 2016, Kris said she'll be there for Jonah "through thick and thin...til we find our forevers." The Kapuso actress watched the ASAP singer's concert early this year. When Sandara celebrated her birthday here in Manila last November, the Kapuso actress went to ABS-CBN compound to personally greet the K-pop star. The two became friends while on the set of action fantasy film Super Noypi in 2006. When Dara left for South Korea, they have remained in touch via Twitter. They have been calling each other "amigah" for 15 years. Wow! These ladies have been friends for 20 years now. Even after Camille became a Kapuso in 2004, they never forgot to invite each other to their life's milestones and celebrations. They became close because of Willie Revillame's defunct TV5 show Wil Time Bigtime, where they were co-hosts. Before she got married, Rufa Mae was a co-host of Willie in GMA's Wowowin, while Mariel returned to ABS-CBN via the noontime show It's Showtime. 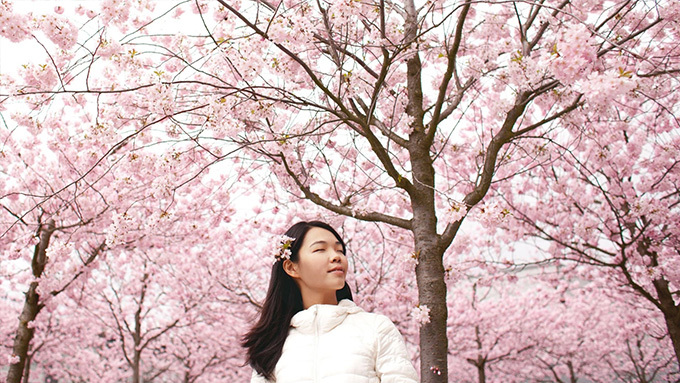 That was in 2015. Almost two years later, both of them are moms now, not to mention, "breast friends." Iza and Sunshine used to be the primetime queens of GMA. They topbilled about six TV series, and took turns in playing the bida and kontrabida. When they played Sang'gres in the original Encantadia, Karylle became part of the squad. Iza and Karylle are now with ABS-CBN. Though Anne and Isabelle are Kapamilya and Solenn is a Kapuso, these three ladies (together with Georgina Wilson and Liz Uy) have had endorsements together. Off cam, they are travel and fitness buddies. These guys were brought together by their love for motorbikes. They call themselves The Brap Pack. Eventually, they became magkumpare (their latest inaanak was Drew's baby) and their wives became close friends. (L-R) Drew, Javy Olives (hubby of Session Road vocalist Hannah), Ryan, and Jericho. Recently, Paulo Avelino (middle) and Gab Valenciano (left) started joining their bike and breakfast activities. Kuya Kim Atienza (not in photo) was spotted, too. The actor and host became friends because of triathlon. Recently, they're becoming biking buddies, too, along with The Brap Packs. Also in photo: Gretchen Fullido, who did the swim leg of their recent race in Subic, Zambales. Their friendship started in 2000, the year Jaya joined SOP. Almost 17 years later, Jaya is now a Kapamilya while Regine remains a Kapuso. But the magkumare still see each other regularly.